to a sweet & spark party! sweet & spark is an up and coming brand, building a reputation as a curator of authentic vintage jewelry by partnering with fashion experts; recently, they've been featured on luckymag.com, the zoe report and pure wow, along with notable fashion blogs gal meets glam, apartment 34, luella & june and sequins & stripes. sweet & spark is for the girl who is obsessed with fashion and appreciates vintage but doesn't have time to sift through overwhelming sites like etsy and ebay or spend her weekends out at flea markets. originally started by a former apparel buyer (for gap inc. & american eagle outfitters), as a lifestyle blog in april 2011, she re-launched as a vintage jewelry brand in november 2012 promoting her dad as head buyer. he’s doing the dirty work scouring yard sales, flea markets & antique shops along the east coast while she’s out west, curating assortments of quality & affordable costume jewelry. at the core they're about gold classics with a focus on american designers from the 40's-90's along the names of monet, trifari, napier, goldette, lisner, kramer and coro. although part of owning something vintage is embracing it's individual character, the overall quality of the collection is consistent. gold plated jewelry tends to age well as they used to triple plate each piece so they don’t tend to tarnish as quickly as today's fashions do. and guess what? 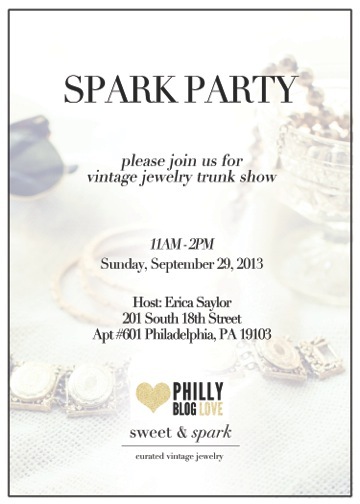 sweet & spark is coming to philly on sunday, september 29th... and you're invited! in collaboration with philly blog love, sweet & spark will be at 201 south 18th street apt. #601 from 11:00am-2:00pm for an awesome vintage jewelry trunk show that you don't wanna miss! so go and get your spark on!